China honed its "salami tactics" in the Himalayas in the 1950s, when it grabbed the Aksai Chin plateau by surreptitiously building a strategic highway through that unguarded region. Aksai Chin, part of the original princely state of Jammu and Kashmir, provided China with the only passageway between its restive regions of Tibet and Xinjiang. Although there is a general framework to settle the India-China border dispute, neither side can move forward with any agreement because a) both sides are "fundamentally distrustful of each other"; and b) domestic politics will prevent either side from making any concessions. He said the talks have reached an impasse, and there is no hope of settling the issue in the near future. Domestic politics play a major role in the dispute, and neither side would be able to make concessions without angering their domestic audience. Although China is not a democracy like India, the Chinese Government is afraid of rousing a public that is already sensitive about border issues. In July 2017 India and China were caught in a lengthy confrontation along their shared frontier, spiking tensions and allowing a rabidly jingoistic press in both countries to aggravate the already deep-seated mutual distrust. The current confrontation seems to be the most serious in recent times and shows no signs of de-escalating. Both countries upped the ante and deployed around 3,000 troops each in the tri-junction. "We firmly believe that the face-off in the Donglang area will end up with the Indian troops in retreat. The Indian military can choose to return to its territory with dignity or be kicked out of the area by Chinese soldiers," China's nationalist tabloid Global Times said on July 5. "This time we must teach New Delhi a bitter lesson." An article on the PLA's English-language website, China Military Online, has warned that "if a solution isn't reached through diplomatic or military communication or the issue isn't handled properly, another armed conflict ... is not completely out of the question." Chinese and Indian border troops confronted each other close to a valley controlled by China that separates India from Bhutan - a close Indian ally - and gives China access to the so-called Chicken's Neck, a thin strip of land that connects India to its remote northeastern regions. It escalated tensions between the neighboring giants, who share a 3,500-kilometer (2,175-mile) frontier, large parts of which are disputed. 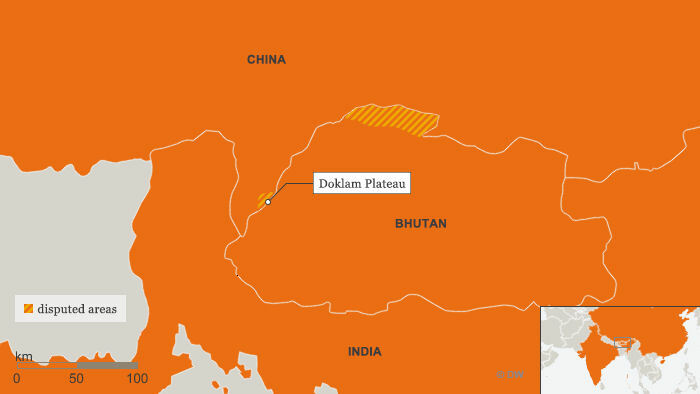 Beijing alleges Indian troops crossed into a region known in China as Donglang, called Doklam in India, early in June and obstructed work on a road on the Himalayan plateau. Chinese officials say the Indian side's actions infringe upon an 1890 border agreement between Britain and China that previous Indian governments pledged to uphold. Bhutan said the construction of the road on its territory is "a direct violation" of agreements with China. "Bhutan hopes that the status quo in the Doklam area will be maintained as before June 16, 2017," its foreign ministry said. 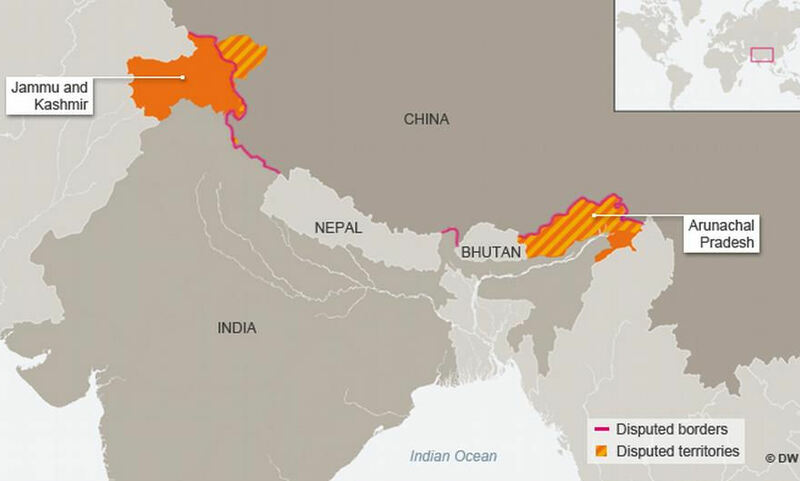 Although China and Bhutan have been negotiating the precise border for decades without serious incident, Bhutan this time sought help from India, which considers the particular patch of mountain to be a strategically vital territory and sent troops to the plateau to stop the Chinese workers. Both sides have failed to fix the issue since then. Chinese officials have also warned India that it should learn "historic lessons" from its humiliating defeat in the 1962 war that both countries fought over their border. In response, Indian Defense Minister Arun Jaitley retorted that "India in 2017 is different from India in 1962," referring to its improved military strength. Indian media issued shrill warnings about Chinese expansionism, while Chinese state media ramped up their bellicose rhetoric, with the nationalist tabloid Global Times warning that Beijing would make no concessions. On assuming power, the People‘s Republic of China (PRC) renounced all prior foreign agreements as unequal treaties imposed upon it during the "century of humiliation" and demanded renegotiation of all borders. The Sino-India border remains the only major territorial dispute, other than South China Sea disputes, that China has not resolved. China‘s growing assertiveness in its territorial claims, especially on Arunachal Pradesh, and its relentless development of infrastructure in Tibet will shape the prospects of Sino-India relations. The territory stretching from the jungles of northern Myanmar, westward to the Karakoram Range, and northward to the edge of the Tibetan plateau can be seen as a single geopolitical system referred to as the Himalayan-Tibetan massif. The ruggedness of this terrain makes movement of men and materiel extremely difficult, thus preventing Indian and Chinese civilizations from intermingling or projecting military power in these remote areas effectively. Not until 1962 did the Chinese and Indian armies fight each other over these desolate heights, thus altering the geopolitics of the region significantly. The McMahon Line boundary dispute is at the heart of relations between China and India. China has land and sea boundary issues with 14 neighbors, mostly for historical reasons. The Chinese have two major claims on what India deems its own territory. One claim, in the western sector, is on Aksai Chin in the northeastern section of Ladakh District in Jammu and Kashmir. The other claim is in the eastern sector over a region included in the British-designated North-East Frontier Agency, the disputed part of which India renamed Arunachal Pradesh and made a state. In the fight over these areas in 1962, the well-trained and well-armed troops of the Chinese People's Liberation Army overpowered the ill-equipped Indian troops, who had not been properly acclimatized to fighting at high altitudes. In the early 20th Century Britain sought to advance its line of control and establish buffer zones around its colony in South Asia. In 1913-1914 representatives of China, Tibet and Britain negotiated a treaty in India: the Simla Convention. Sir Henry McMahon, the foreign secretary of British India at the time, drew up the 550 mile (890 km) McMahon Line as the border between British India and Tibet during the Simla Conference. The so-called McMahon Line, drawn primarily on the highest watershed principle, demarcated what had previously been unclaimed or undefined borders between Britain and Tibet. The McMahon line moved British control substantially northwards. The Tibetan and British representatives at the conference agreed to the line, which ceded Tawang and other Tibetan areas to the imperial British Empire. However the Chinese representative refused to accept the line. Peking claimed territory in this far north down to the border of the plain of Assam. The land is mostly mountainous with Himalayan ranges along the northern borders criss-crossed with mountain ranges running north-south. These divide the state into five river valleys: the Kameng, the Subansiri, the Siang, the Lohit and the Tirap. High mountains and dense forests have prevented intercommunication between tribes living in different river valleys. The geographical isolation thus imposed has led different tribes to elove their own dialects and grow with their distinct identities. Nature has endowed the Arunachal people with a deep sense of beauty which finds delightful expression in their songs, dances and crafts. A slow forward move towards the McMahon Line was begun on the ground, to establish a new de facto boundary. The McMahon Line was then forgotten until about 1935 when the British government decided to publish the documents in the 1937 edition of Aitchison's Collection of Treaties. The NEFA (North East Frontier Agency) was created in 1954. On 7 November 1959, Chou En-lai proposed that both sides should withdraw their troops twenty kilometers from the McMahon line. The issue was quiet during the decade of cordial Sino-Indian relations, but erupted again during the Sino-Indian War of 1962. During the 1962 war, the PRC captured most of the NEFA. However, China soon declared victory and voluntarily withdrew back to the McMahon Line. China is in occupation of approximately 38,000 sq. kms of Indian territory in Jammu and Kashmir. In addition, under the so-called China-Pakistan "Boundary Agreement" of 1963, Pakistan ceded 5,180 sq. kms. of Indian territory in Pakistan Occupied Kashmir to China. China claims approximately 90,000 sq. kms. of Indian territory in Arunachal Pradesh and about 2000 sq. kms. in the Middle Sector of the India-China boundary. Beijing has stated that it does not recognise Arunachal Pradesh. The border between China and India has never been officially delimited. China's position on the eastern part of the border between the two countries is consistent. Not a single Chinese government recognizes the "illegal" McMahon Line. For China, the McMahon Line, stands as a symbol of imperialist aggression on the country. The so-called "Arunachal Pradesh" dispute is China's most intractable border issue. Because the gap between the positions of China and India is wide, it is difficult for both nations to reach consensus. The area of this disputed region is three times that of Taiwan, six times that of Beijing and ten times that of the Malvenas islands, disputed by Britain and Argentina. It is flat and rich in water and forest resources. Arunachal Pradesh is the only issue which has a potential for conflict between India and China. If ever India and China go to war one day, it will be on this issue. India considers recurring Sino-Indian border clashes a potential threat to its security. Since the war, each side continued to improve its military and logistics capabilities in the disputed regions. China has continued its occupation of the Aksai Chin area, through which it built a strategic highway linking Xizang and Xinjiang autonomous regions. China had a vital military interest in maintaining control over this region, whereas India's primary interest lay in Arunachal Pradesh, its state in the northeast bordering Xizang Autonomous Region. Barring an armed clash at Nathu La in eastern Sikkim in 1967, the border between India and China (Tibet) - and specifically the ill-defined Line of Actual Control (LAC) in Ladakh/Aksai Chin and Arunachal Pradesh - had remained free of any major incidents through the 1970s and the early 1980s. While relations between the two countries remained cool,, official statements from Beijing and New Delhi professed a desire to solve the border tangle peacefully through mutual consultations. Beginning in December 1981, officials from both countries held yearly talks on the border issue. With the improvement of logistics on the Indian side, the Indian Army sought to reinforce and strengthen forward areas in Arunachal Pradesh in the early 1980s. Patrols resumed in 1981 and by the summer of 1984 India had established an observation post on the bank of the Sumdorong Chu [referred to as Sangduoluo He in the Chinese media]. In July 1986 there were reports in the Indian media of Chinese incursions into the Sumdorong Chu [S-C] rivervalley in Arunachal Pradesh. By September-October, an brigade of the Indian Army 5 Mountain Division was airlifted to Zimithang, a helipad very close to the S-C valley. Referred to as Operation Falcon, this involved the occupation of ridges overlooking the S-C valley, including Langrola and the Hathung La ridge across the Namka Chu rivulet. This was followed by reports of large-scale troop movements on both sides of the border in early 1987, and grave concerns about a possible military clash over the border. In February 1987, India established the so-called Arunachal Pradesh in its ["illegally occupied"] Chinese-claimed territories south of the McMahon Line. The Chinese side made solemn statements on many occasions that China never recognizes the "illegal" McMahon Line and the "so-called" Arunachal Pradesh. After these events, and India's conversion of Arunachal Pradesh from union territory to state, tensions between China and India escalated. Both sides moved to reinforce their capabilities in the area, but neither ruled out further negotiations of their dispute. China, which had always maintained a large military presence in Tibet, was said to have moved in 20,000 troops from the"53rd Army Corps in Chengdu and the 13th Army in Lanzhou by early 1987, along with heavy artillery and helicopters. By early April, it had moved 8 divisions to eastern Tibet as a prelude to possible belligerent action. Reinforcements on the Indian side began with Operation Falcon in late 1986, and continued through early 1987 under Exercise Chequerboard. This massive air-land exercise involved 10 Divisions of the Indian Army and several squadrons of the IAF. The Indian Army moved 3 divisions to positions around Wangdung, where they were supplied solely by air. These reinforcements were over and above the 50,000 troops already present across Arunachal Pradesh. Although India enjoyed air superiority in 1987, rough parity on the ground existed between the two military forces, which had a combined total of nearly 400,000 troops near the border. The Indian Army deployed eleven divisions in the region, backed up by paramilitary forces, whereas the PLA had fifteen divisions available for operations on the border. Most observers believe that the mountainous terrain, high-altitude climate, and concomitant logistic difficulties made it unlikely that a protracted or larges-cale conflict would erupt on the Sino-Indian border. That the Sino-Indian border has not suffered any major disruptions since 1986, as compared to the incessant firing incidents and infiltration on the Indo-Pak borders, made the Sino-Indian border an example of good neighbourly relations. In December 1988, Indian Prime Minister Rajiv Gandhi visited China. The Prime Ministers of the two countries agreed to settle the boundary questions through the guiding principle of "Mutual Understanding and Accommodation and Mutual Adjustment". Agreement also reached that while seeking for the mutually acceptable solution to the boundary questions, the two countries should develop their relations in other fields and make efforts to create the atmosphere and conditions conducive to the settlement of the boundary questions. The two sides agreed to establish a Joint Working Group (JWG) on the boundary questions at the Vice-Foreign Ministerial level. An Agreement on the Maintenance of Peace and Tranquility along the Line of Actual Control in the India-China Border Areas was signed on 7 September 1993. After more than thirty years of border tension and stalemate, high-level bilateral talks were held in New Delhi starting in February 1994 to foster "confidence-building measures" between the defense forces of India and China, and a new period of better relations began. In November 1995, the two sides dismantled the guard posts in close proximity to each other along the borderline in Wangdong area, making the situation in the border areas more stable. During President Jiang Zemin's visit to India at the end of November 1996, the Governments of China and India signed the Agreement on Confidence Building Measures in the Military Field along the Line of Actual Control in the China-India Border Areas, which is an important step for the building of mutual trust between the two countries. These Agreements provide an institutional framework for the maintenance of peace and tranquility in the border areas. Though lot had been done during the Sino-Indian official border talks, with number of border related CSBMs put in place, the border issue remains mired in various bilateral and domestic compulsions and contradictions on both sides. Border 'encounters' between India and China are not rare and arise from the very real disagreements that exist between the two sides in demarcating the LCA on the ground. Such incidents have usually been handled, not in full media glare, but by the two sides discreetly withdrawing to their earlier positions. The two sides withdrew sentries along the eastern section that were considered to be too close to each other. During early 1990s, India unilaterally withdrew about 35,000 troops from its eastern sector. On the other hand, the PLA maintains a force between 180,000 and 300,000 soldiers and has directly ruled Tibet from 1950 to 1976, and indirectly thereafter. Tibet today is connected to other military regions through four-lane highways and strategic roads. And Beijing's capability to airlift troops from its other neighbouring military regions has advanced very far from its comparative inability to use air force in 1962. During the Indian Prime Minister's visit to China in June 2003 India and China signed a Memorandum on Expanding Border Trade, which adds Nathula as another pass on the India-China border for conducting border trade. The Indian side has agreed to designate Changgu of Sikkim state as the venue for border trade market, while the Chinese side has agreed to designate Renqinggang of the Tibet Autonomous Region as the venue for border trade market. During Chinese Premier Wen Jiabao's visit to India in April 2005, the two sides signed an agreement on political settlement of the boundary issue, setting guidelines and principles. In the agreement, China and India affirmed their readiness to seek a fair, reasonable and mutually acceptable solution to the boundary issue through equal and friendly negotiations. India after 1962 adopted a policy to not develop the border areas. The idea was that if India developed the border areas, the Chinese can easily use these facilities in the event of a war. This policy had changed by 2008. To redress the situation arising out of poor road connectivity which has hampered the operational capability of the Border Guarding Forces deployed along the India-China border, the Government has decided to undertake phase-wise construction of 27 road links totaling 608 Km in the border areas along the India-China border in the States of Jammu & Kashmir, Himachal Pradesh, Uttarakhand, Sikkim and Arunachal Pradesh at an estimated cost of Rs.912.00 crores. The work of construction of 2 roads in Arunachal Pradesh has started. The construction of these roads was expected to start during 2008-09. The two sides have differences in perception of the Line of Actual Control (LAC) in the India-China border areas. Both sides carry out patrolling activity in the India-China border areas. Transgressions of the LAC are taken up through diplomatic channels and at Border Personnel Meetings/Flag Meetings. India and China seek a fair, reasonable and mutually acceptable settlement of the boundary question through peaceful consultations. Chinese President Hu Jintao met with Indian Prime Minister Manmohan Singh in Sanya City, south China's Hainan Province, April 13, 2011. Hu said China is willing to further push forward negotiations on border issues on the basis of peace and friendliness, equal consultation, mutual respect and understanding. The two sides should consider setting up a consultation and coordination mechanism on border issues so as to achieve consensus as soon as possible and to better maintain peace and stability at the border regions before the issues are solved. China wants India to put behind the 1962 war as an "unfortunate" thing of the past and that the two countries should strengthen their military ties including formalising a border management pact under which their troops will not fire at each other. The Chinese assessment was conveyed to the Indian defence ministry team which visited Beijing on 14-15 January 2013 for the third round of the annual defense dialogue between the two countries. Border tensions between China and India flared after New Delhi claimed a contingent of 30 to 50 PLA soldiers crossed about 12 miles beyond the Line of Actual Control between the two countries on 15 April 2012 and stayed there for three weeks. According to New Delhi, PLA soldiers frequently conduct border incursions (more than 600 times over the last three years) but do not usually cross more than a few miles over the Line of Actual Control nor stay there longer than several hours. President Xi Jinping met Indian Prime Minister Manmohan Singh at the BRICS Summit in Durban, South Africa, 29 March 2013. Xi urged both sides to use special representatives to strive for a fair, rational framework that can lead to a solution to the border issue as soon as possible. India will abide by political guidelines set by both sides and seek a solution to the border issue with a commitment to safeguarding peace, Singh said. Since 2003, more than a dozen rounds of talks had been launched to resolve the border disputes. But ties have still been occasionally strained by the issue and overshadowed by closer India-US relations amid Washington's accelerating Asia "pivot" policy. Beijing and New Delhi resolved the April border impasse in May after a series of talks and agreed to pursue a formal agreement to build trust and confidence between the border troops. The two sides signed the agreement during the Indian prime minister’s trip to China in October 2013. China and India concluded a border defense cooperation pact 24 October 2013, making it a highlight of Indian Prime Minister Manmohan Singh's visit to the Asian neighbor. The Indian Express newspaper said the pact also puts no restrictions on India developing border infrastructure or enhancing military capabilities along the border. It quoted India's Ambassador to China S. Jai Shanker as saying: "This principle allows both countries to take appropriate measures according to their own security needs." Chinese troops entered disputed territory along the Sino-Indian border, Indian media sources reported, claiming it's not the first time China has made an incursion into the Indian border region. "Chinese troops are reported to have entered 25 to 30km deep into Indian territory in Burtse area in Ladakh where they had pitched their tents last year that had led to a tense three-week standoff," The Times of India reported on 18 August 2014. Citing official sources, the media outlet notes that troops from the People's Liberation Army were spotted on Monday near the 'New Patrol base' post in Ladakh's Burtse area. According to these sources, the PLA has crossed a de-facto border known as the Line of Actual Control (LAC) and moved deeper into Indian-held territory. The PLA reportedly carried flags reading "this is Chinese territory, go back" in their hands. India Prime Minister Narendra Modi urged visiting Chinese President Xi Jinping to resolve a boundary dispute after holding talks in New Delhi 18 September 2014 that lasted much longer than the stipulated 90 minutes. Modi said he had raised serious concerns over the issue with Chinese President Xi Jinping. He said the boundary dispute must be resolved soon. The Indian leader said they were clear that peace on the border has to be the foundation of the trust and relationship between the two nations. Modi called for an early clarification of the “line of actual control” which presently separates the two countries. He said if this happened “we can realize the potential of our relations." Xi’s visit to India took place as troops from both countries were engaged in a border standoff in the Ladakh region - one of their worst in recent years. The Chinese leader played down the tensions, attributing such incidents to their undemarcated border. India's foreign minister said 26 September 2014 that India and China had resolved a tense, two-week military border standoff in the northern Himalayan region. Sushma Swaraj said after meeting with Chinese counterpart Wang Yi in New York that Chinese troops would begin withdrawing Friday 26 September 2014 and would be finished by Tuesday. She described the resolution as a "big accomplishment." Hundreds of Chinese troops moved into a territory claimed by India, sparking the standoff on the remote mountainous frontier of Ladakh. India said the Chinese troops wanted to extend a road they were building on their side of the border into territory claimed by India. China agreed not to extend the road into the disputed territory. In return, India agreed to demolish a recently built observation hut.